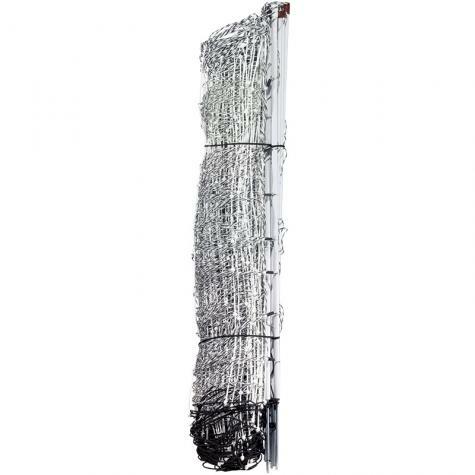 Electric mesh netting that has 9 horizontal twines (8 conductive); is 35" tall installed, and has large white plastic vertical struts every 12". Keeps sheep, goats, guard dogs in while keeping out stray dogs, coyotes, fox and bears. Can be used for cattle and domestic hogs. Same mesh as ElectroNet 9/35/12 but this net has drivable posts (.75" dia.) 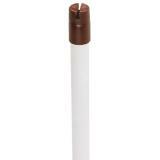 are much stronger and stiffer than standard line posts and can be pounded in with a dead-blow hammer or mallet. Fence installs easily in hard/frozen soils as well as soft soils. Pushing in posts is no longer necessary. Each roll is a complete fence with the drivable posts already built into the mesh/fence. One roll (100 ft) weighs only 14 lbs. You will need a fence energizer to electrify the net. Used to keep sheep, goats, guard dogs in while keeping out stray dogs, coyotes and fox. Can be used for cattle and domestic hogs. Note: Can also be used for beehive protection to keep out livestock and bears. Posts are drivable. Easier to set up and move. 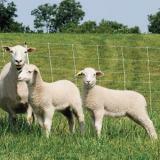 Secure for adults, lambs and kids. Visible for animals against all back grounds. End posts act as built in gates. #201050 - $1.43 per ft (100' roll with drivable posts). #201051 - $1.89 per ft (100' Pos/Neg roll with drivable posts). We love these fences more than any others we have purchased. They are easy to set up, come with extra wire and are much more sturdy. Love this fence! Its a big improvement over the flimsy spikes of the other sheep fence when trying to build fence in dry soil. This fencing is an excellent choice for goats. 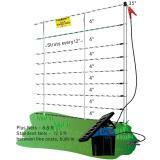 I am using the PRS100 energizer and I am told it can electrify 8 lengths of 100' fencing, this is enough to fence in almost an acre. Very easy to set up in rocky soil with the driveable posts. 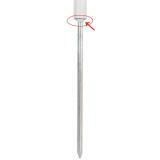 Also the larger diameter posts do not sag at the corners. The only thing I would add is a couple extra posts to your order to help keep the fence on the ground when going across low areas. I am very satisfied with all the products I have received from Premier1. Keep up the good work.